With the extension tubes, two of my 1:2 macro can get close and over the 1:1 magnification ratio. The extension tubes can be stacked together to add addition of magnification (extension length / Lens' focal length) to the macro ratio. For instance, Joachim uses two extension tubes in stacking 36mm and 20mm together to yield 56/100 + 1/2 ~ 1.1 which is over the 1:1 magnification ratio. My Vivitar AT-22 extension tubes are well built with fine material and finish. Though it does not have the electrical contacts, it has the mechanical aperture control that allows one to do stop down metering. It is unlike many other extension tubes that don't have the mechanical linkage to do stop down metering. I used the 20mm extension tube with my Pentax A 50mm f/2.8 1:2 Macro. The addition of magnification ratio is 20/50mm = 0.4 making my 1:2 Macro near 1:1. Here are few test shots that I did one morning. The wind was getting in the way with focusing and I did all shots with single hand, hence the softness in some of the test shots. I hand held the shot with my right hand while I used my left hand in holding the flower still, you can actually see my left hand in the bokeh. 1:1 macro is difficult to do in hand holding as the DOF range is razor thin making hand holding a big challenge. The difficulty holds true in other setup with macro extension and diopter but the extension tubes may make it even harder for me with the loss of trap focus. I am not certain if I dial in the correct SR focal length. With the 20mm mounted on my A 50mm f/2.8 Macro, I dial in 70mm. Need to confirm with others. Thanks for this article. 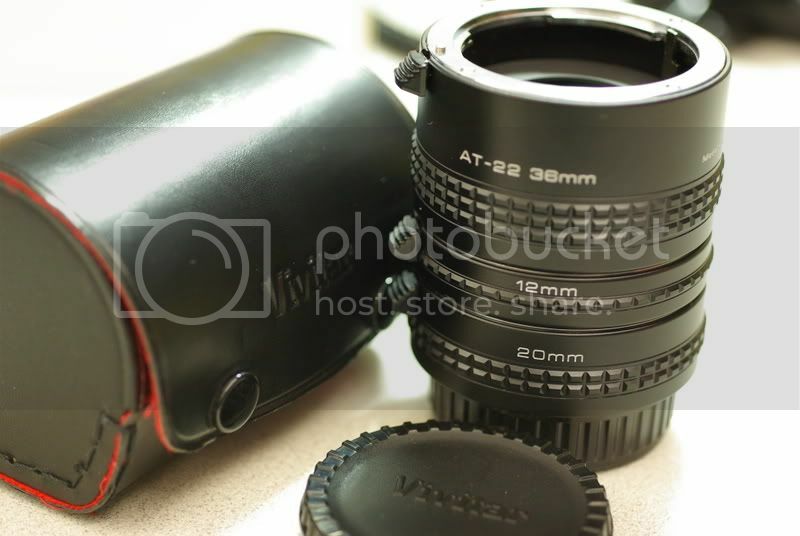 there's a set on offer on Pentaxforums.com but I think I'll wait and save for a true autofocus macro lens. Hin, Stop down metering didn't worked for me. Did it work out of box or you had to rub off some paint of AT-22 mount? It works for me right out of the box. I no longer have this extension tube. I will suggest you to try using a K-mount lens and see if your camera setting works with K-mount in stop-down metering. I think there is a setting in setup to allow meter with aperture ring. Hope you find your solution. Hin, normal stopdown works as expected (without AT-22). I think you might have tried it with camera earlier than k-x/k-7. Seems like hey have changed the firmware (after k-x/k-7) and now it requires to short contacts to activate stopdown metering. A small aluminium foil helped.